Bertram Rippington Brasnett (son of Stanley Brasnett and Alice Rippington) was born 1893 in Marham, Norfolk, England401, and died 1988. 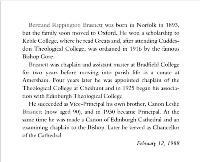 THE Reverend Dr Bertrand Brasnett, who has died aged 95, was in his day a considerable theologian. But his genius was accompanied by a degree of eccentricity, and when his academic career in Edinburgh ended suddenly in 1942 he retired to Oxford, where he spent the rest of his life as a recluse. His fine trilogy on the nature of God, published between 1928 and 1935, earned him an Oxford doctorate in divinity and has continued to illuminate and exercise the minds of serious scholars, among them the renowned Prof Jurgen Moltmann of Tubingen. His work on the difficult question of whether or not God can suffer was to be of lasting value. Brasnett was an exacting teacher, with more than a touch of the Victorian martinet in his style. 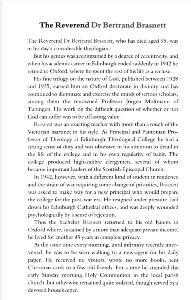 As Principal and Pantonian Professor of Theology at Edinburgh Theological College he had a strong sense of duty and was obsessive in his attention to detail in the life of the college and in his own regularity of habit. The college produced highcalibre clergymen, several of whom became important leaders of the Scottish Episcopal Church. In 1942, however, with a different kind of student in residence and the strain of war requiring some change of priorities, Brasnett was asked to make way for a new principal who would prepare the college for the postwar era. He resigned under pressure, laid down his Edinburgh Cathedral offices, and was deeply wounded psychologically by a sense of rejection. Thus the bachelor Brasnett returned to his old haunts in Oxford where, sustained by a more than adequate private income, he lived for another 45 years in complete privacy. At the same time every morning, until infirmity recently intervened, he was to be seen walking to a newsagent for his daily paper. He received no visitors, wrote no more books, sent Christmas cards to a few old friends. For a time he attended the early Sunday morning Holy Communion in the local parish church, but otherwise remained quite isolated, though served by a devoted housekeeper. Bertrand Rippington Brasnett was born in Norfolk in 1893, but the family soon moved to Oxford. He won a scholarship to Keble College, where he read Greats and, after attending Cuddesdon Theological College, was ordained in 1916 by the famous Bishop Gore. Brasnett was chaplain and assistant master at Bradfield College for two years before moving into parish life as a curate at Amersham. Four years later he was appointed chaplain of the Theological College at Cheshunt, and in 1925 began his association with Edinburgh Theological College. He succeeded as Vice-Principal his own brother, Canon Leslie Brasnett (now aged 90), and in 1930 became Principal. At the same time he was made a canon of Edinburgh Cathedral and an examining chaplain to the Bishop. Later he served as Chancellor of the Cathedral.